Estimated taxes are taxes on income that aren't withheld by an employer. According to the U.S. Internal Revenue Service (IRS), estimated tax payments are not required unless employer withholdings account for 9.99% or less of an employees income or less than a tax filers previous year's tax. An income witholding document called a Form W-4 is used by employers to determine income withholdings. These withholdings are determined using allowances that can reduce income tax owed. The income retained by the employer is paid to the IRS thereafter. 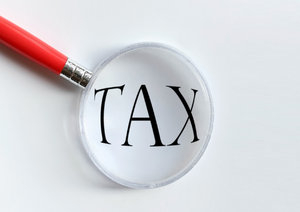 Paying estimated taxes can be done all at once or in four non-quarterly installments beginning April 15th of the tax year for which the estimated taxes are being paid. Income earners who expect to owe more than $1000 of tax in a tax year must pay estimated tax to the IRS. If you are not required to pay estimated tax, then there is no need to pay estimated tax. To find out if you must pay estimated tax review the criteria above and the information in IRS Publication 505. IRS Publication 505 contains many details and rules regarding who should pay estimated tax. To calculate estimated tax, complete the worksheet and refer to the tax tables provided in the IRS estimated tax publication 1040-ES. This worksheet begins with an estimated Adjusted Gross Income (AGI), a number which estimated tax will be calculated with. The worksheet serves a similar purpose as a pro-forma and pre-determines tax due with similar deductions to IRS Form 1040. Estimated taxes can be filed online or via paper forms and mail. If filing online vouchers do not need to be sent to the IRS. An example of an online estimated tax filing platform is www.estimatedtaxes.com. Sites like this are different from regular 1040 filing sites. The IRS is the recipient of the estimated tax payment. Sending the payment to the correct location along with accurate information is important. 6 IRS processing centers exist throughout the U.S. to service tax filers within specific regions. U.S. tax filers living in States i.e. not territories of the U.S. should send estimated tax forms to the correct IRS processing center also indicated in the Form 1040-ES instructions. Each U.S. State may have estimated tax requirements of its own. For example, the State of Michigan has an estimated tax and also uses a Form 1040-ES, however this 1040-ES is not federal. The instructions and process for paying estimated state taxes can be found via your state department of revenue or websites like easyestimatedtaxes.com that illustrate and link to estimated tax requirements for all 50 states.